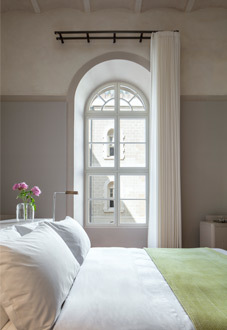 The first luxury hotel of its kind, The Jaffa is located within the walls of a 19th century complex that once housed Jaffa's French Hospital. The Jaffa provides unrivaled exclusivity in an internationally desirable destination. Surrounded by the city’s most fashionable neighborhood and just minutes from the beach, The Jaffa provides a perfect blend of service, style, and state-of-the-art luxury. Designed by renowned architect John Pawson in collaboration with Ramy Gill, the duo transformed the original structure into a blend of modern-meets-historic, while remaining true to the original building's heritage andvisual details. Just like its namesake, The Jaffa is a mix of old and new. You can choose to stay in our exquisitely restored 19th-century wing, boasting lofty ceilings and arched windows, or in our contemporary building, embracing a more modern architectural style. Our 120 rooms and suites offer stunning views of Jaffa, the Mediterranean, or our enchanting courtyard. Amenities include state of the art fitness center, outdoor pool, L. Raphael spa, The Chapel bar & lounge, and two restaurants from Major Food Group, Don Camillo and Golda’s Delicatessen.